All “FairWinders” are grateful for the external acknowledgement of our vision and strategy through the numerous awards we have received over the years. along with having a profit at least three of those four years. 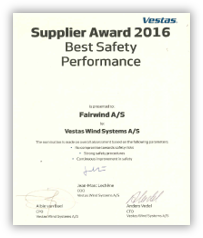 A prize given to FairWind on the basis of our general performance, and which primarily should be seen as an affirmation of the way we work on-site and the procedures our technicians are following in FairWind. 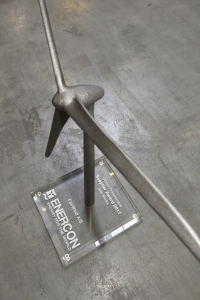 A prize only awarded to a few of GE’s many international suppliers, and which acknowledges both the quality of FairWind’s operations as well as FairWind’s position in the market. 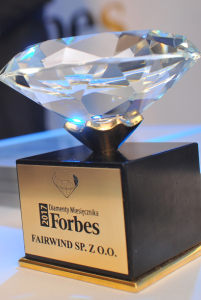 FairWind was awarded the prize in 2017, only 3 years after commencing business with GE, which underlines the rapid market penetration of FairWind and our competitive strategy and product offering. Winner of the category medium-sized companies in the West Pomeranian Province in Poland, and ranked 23 across the whole of Poland. The prize is awarded to the companies having had the biggest increase in their market capitalisation during the course of a 3 year period. A prize acknowledging FairWind’s dedication to safety in the industry and the different installation sites we are working on, along with our effort in further increasing the safety in the future. The prize is only awarded to 3 of Vestas’ more than 40 global suppliers which have performed extraordinarily on the safety-KPIs given by Vestas, and which have generally put an extra effort into safety. A prize acknowledging FairWind’s offerings within servicing of wind turbine blades, as well as our market position within service. 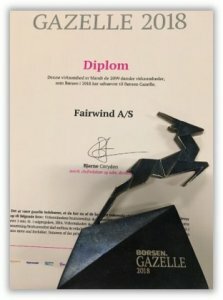 Despite service, and especially servicing of blades, is not yet a part of our core business, it is an area of increasing focus in FairWind, and this prize is certainly acknowledging our effort and focus within the area. Most growing company in in the West Pomeranian Province in Poland, and ranked 79 nationally in 2015. The year after, FairWind was likewise awarded and ranked in the top of the list. The award is given to companies, which, over the course of 3 years, have experienced growth in the revenue every year, have had a profit every year, as well as having had a revenue between PLN 3 million and 200 million in the first of the 3 years, equal to a revenue between DKK 5 million and 350 million.